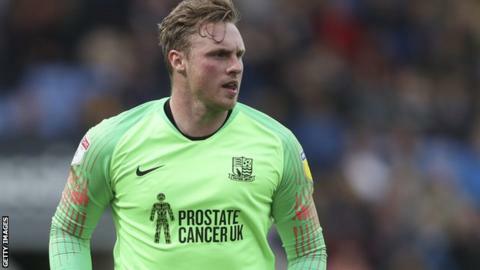 League One club Wycombe Wanderers have signed goalkeeper David Stockdale on an emergency loan from Birmingham City for seven days to provide injury cover. The 33-year-old will be available for the Chairboys' game at home to Shrewsbury Town on Saturday and Tuesday's trip to Accrington Stanley. Stockdale's arrival comes after injuries to Wycombe's senior keepers Ryan Allsop and Yves Ma-Kalambay. He was in the PFA's Championship team of 2017 after helping Brighton go up. Queens Park Rangers' Matt Ingram joined Wycombe on a seven-day emergency loan on 15 November, but he could not stay with Gareth Ainsworth's side any longer. "We were extremely grateful to QPR for allowing Matt to join us for the Sunderland game, but now they need him back to provide cover, so we have had to look elsewhere," Ainsworth told the club website. "David comes to us with a fantastic pedigree and we have no doubts that he'll be more than capable of coming straight into the side and performing to a very high standard for us." Stockdale made 39 appearances for Birmingham last season, but has not played for his parent club this term.